It’s been years since I’ve crocheted an afghan. I learned to crochet from my grandmother. She had been crocheting my whole life, but it wasn’t until I was an adult that I decided to approach her about learning that craft. One afternoon, we sat down together, she gave me an extra hook and skein of yarn, and she showed me her technique. Learning how to read patterns and how to make the stitches wasn’t that difficult for me, but it took me a long time to figure out how to hold the yarn in my hand, finding that sweet spot between too much slack and too much tension. My first project turned into a doll blanket for my daughter that was more triangular than rectangle due to the learning curve I needed to figure out how to hold the yarn in a way that allowed my stitches to be even. Eventually, I improved. I was able to churn out hats and dishcloths at about the same pace that my grandmother did. I had access to the internet and she did not, so I would print off new patterns for her to try. One time, I was able to teach her a trick she hadn’t seen before. For Christmas, I crocheted her one of my first truly ambitious afghans. She kept it over the back of her couch until she moved out of the house a few years ago. When I’ve made blankets in the past, they have primarily been for a special occasion. A new baby coming. A Christmas gift. 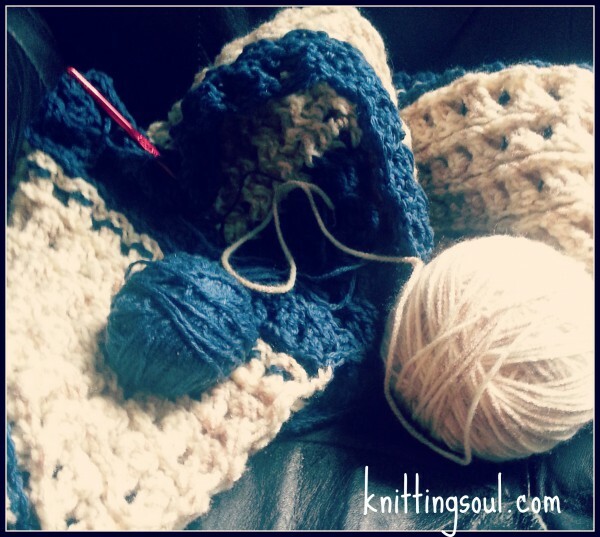 When I started writing in earnest, I stopped knitting and crocheting almost altogether. All of my free time went into working pitching agents, working on book proposals, writing up sample chapters. Taking on a project as large as an afghan seemed like a waste of time. Right now, writing is not my primary concern. The dream of writing a book is not dead, but it’s certainly on hold for this season. And while it feels right now like many of my goals are of the long-term sort, I wanted to make an afghan. I’ve inherited most of Gram’s yarn over the years. I’ve gone through and found colors that match speak of autumn to me. I found a new pattern that I know she would have wanted me to print out so she could try it. So I’ve started working on an autumn afghan. Something that brings warmth. Something I can cover a child with when they fall asleep on the couch. Something my husband and I can cuddle under when the temperatures turn cold. Something I can wrap around my shoulders when I want to sit out on the porch on a Sunday morning, watching the fall creep across the landscape. Something that adds a bit of comfort and beauty to our home. It won’t finish quickly. I don’t even know if I’ll have it done before this season slips into the next. But with each stitch I am making something that will last not just for this autumn, but for many to come. This entry was posted in Grief and tagged afghans, crochet, goals, grief. Bookmark the permalink. We definitely have seasons of action and seasons of waiting. But both can be fruitful. I used to crochet a lot. Taught myself when I had the flu when my kids were little. But these days? Hardly ever. I LOVE that pattern and may just have to try it. Thanks, Alise. When I do it, I actually find it therapeutic, in a strange sort of way. Maybe you will, too? I just decided to follow some of the sites that popped up about afghans and crochet in my reader, and landed here. Love that pattern, and bookmarked it for later. I knit and crochet both, but lately have been making afghans and market bags to be stored for Christmas gifts. I’m using a pattern called Corner to Corner (C2C) and love how it works up so quickly. Two down on the afghans, 3 to go, and the market bags take a day or so, lining them a bit longer, but lots of fun. Good luck with your afghan. It will be beautiful.